So your 15 year old gas boiler has broken down again and is on its last legs and you can’t face spending money on repairs again. It’s finally time to start thinking about replacing it but you have no idea what it’s going to cost as the last time you bought a new boiler is a hazy distant memory. This guide to gas boiler replacement costs will arm you with more knowledge to make the task of replacing your central heating system a little less daunting. High pressure (unvented) system with separate hot water cylinder. How do you identify which system you have? Well if your hot water is heated by the gas boiler for immediate use and you don’t have a hot water cylinder then you are likely to have a combination boiler or “combi”. If you do have a hot water cylinder then the gravity fed system can be identified if you have a cold water tank and an expansion overflow tank (often in the loft of a house). High pressure (unvented systems) are less common but do not have tanks in the loft and deliver water at mains pressure. If you already have a combination boiler and you are happy with its overall performance then a like-for-like replacement is a good option. Depending on the output of your old boiler you may wish to consider increasing the boiler size if you want to boost the hot water supply for a more powerful shower. Combination boilers of 30kW and upwards are now available. For gravity fed central heating systems the choice becomes more complex. Few heating engineers these days would recommend a gravity fed system for a completely new installation as they have some limitations – not least a cold water tank in the loft that has the potential to burst and cause water damage. However if you are on a budget and happy with the heating system then a like-for like replacement is certainly a realistic option. For flats and 1-2 bedroom houses where the hot water consumption is relatively low then a combination gas boiler can also be a very good option. Replacing a gravity system with a combi is usually quite straightforward and can free up the space where the hot water cylinder is sited. There are two sorts of boiler that can be used when replacing: system boilers and heat only boilers. Many older boiler systems have external pumps to move the heated water around and for these a heat only boiler can be used. A system boiler has the pump built into the boiler itself, which reduces the plumbing an installer is required to do but it does increase the cost of the boiler. So if the rest of your system is fine then a heat only boiler can be a good option whereas if you need to replace other elements it may be worth considering a system boiler instead. These are generally installed in larger houses where the hot water demands of a large family may outstrip a combination boiler’s capacity. Generally they would be replaced like-for-like although the same consideration needs to be given to whether a system boiler or a heat only boiler is the better option. Your heating engineer can guide you on this. Almost all new boilers supplied since 2003 have been of the more fuel efficient condensing type. These have efficiencies of 90% upwards and are ‘A’ rated. Older boilers can often be G rated or 50-70% efficient so by switching to a condensing boiler you should save money on your fuel bills. The downside of a condensing boiler is that it produces a small but steady stream of water which needs to be drained away. A condensing boiler needs access to a drain either internally (ideally) or externally. Depending on the position of your boiler this can be easy to do or practically impossible. Where it is difficult to do it may be worth considering moving the boiler position rather than incurring unnecessary extra cost. As the system will need to be adjusted by re-siting the boiler it may also lead you to decide to switch boiler types. More likely, you will have to add a condensate pump to pump the waste water to the nearest drain outlet. It is important that the condensate pipe is not allowed to freeze so if it drains to the outside it should be insulated. There are limited governments grants available for those replacing a non-condensing boiler. Read more about boiler grants. If you are looking to replace the hot water cylinder on your gravity fed or high pressure system hot water and like the idea of using solar water heating then it’s also worth thinking about a twin coil hot water cylinder. These cylinders can connect to a conventional gas boiler as well as a solar heated flow from a solar water heating panel. When the sun is shining then the hot water is heated for free (in the Summer 80-90% of your hot water needs can be covered). In the winter the heat from the sun needs to be topped up with your gas boiler (probably only 20-30% of your hot water needs will be covered by solar). Solar water heating systems do add quite a cost to the system but you can offset some of the cost with the savings in fuel you will make. In addition, there is a government scheme, the Renewable Heat Initiative (RHI), which pays 19.51p per kWh of heat produced. That means the government pays you, for 7 years, every time you heat hot water using solar water heating panels. Nowadays solar PV panels for generating electricity are quite popular. Excess electricity is normally exported to the electricity grid but products now exist to divert this extra energy into an immersion heater which is used to heat your hot water. See solar panels for more details on solar systems. If you plan to use solar water heating in the future you may steer away from switching to a combination boiler. Changes in gas regulations mean that 15mm gas supply pipes may need upgrading to 22mm or even 28mm. The installer should measure the pressure drop between the gas meter and the boiler and if it is too great, or the supply pressure is below the boiler manufacturers minimum operating pressure, the supply pipe will need to be upgraded. If the pressure is too low there may be problems when different gas appliances are operated at the same time. It’s part of the responsibility of the installer to ensure this is correct. If you are switching to a higher output boiler you may also need to upgrade the supply pipe. Increased safety concerns mean that some older types of boiler flue arrangement may no longer be permitted as they do not meet current industry guidelines. This may require the boiler flue to be modified or replaced. As highlighted above under condensing boilers, modern condensing boilers require a drain outlet for the condensed liquid they produce. When replacing an older non-condensing boiler a new condensate drain pipe will have to be added. Even if a condensate pipe is fitted, experience has shown that it could be at risk of freezing and the installer may well want to increase its size and ensure that it is properly lagged. 4: What’s A New Boiler Going To Cost? Well now you have a better view of what system you want, let’s try and get a better idea of the gas boiler replacement cost. There are some general costs and a number of costs that depend on the state of the current system. Prices of different types of boiler can be found at Gas combination boiler prices, Gas heat only boiler prices, Gas system boiler prices. where any pipes or cables run; i.e. will they be visible and how will they be fixed to the wall; are they going to be painted or boxed in? when running condensate pipes to the outside how will the pipe be insulated; where any brickwork or paving slabs have to be lifted how are they going to be re-instated? The next step is to get two or three estimates from local installers you trust so you can compare their gas boiler prices. Ask family or friends for recommendations. Ask for itemised quotations so you can make a fair comparison. Also get written confirmation of any warranties on the boiler and other parts of the system. See Boiler Upgrades Explained. If you want a more specific indication of what you may pay then use our replacement boiler cost online calculator. You can then compare any quotations from installers with our guideline estimate. If you want a quick way to get quotes from local installers using the Boiler Guide service then click here. We have an elderly heat-only boiler with a gravity-fed HW and CH system. Can the boiler be replaced by a combi boiler but without installing any new pipe work – I.e. using the existing pipework? Your (very clear and helpful) outline refers to installing new pipework. Thank you very much. Replacing a gravity fed system with a combi-boiler one is quite a popular approach which most heating engineers should be comfortable with doing. However there are some key points that the installer should consider when doing this. *A gravity system operates at low water pressure (typically under 0.2 bar) whilst a combi boiler would be operating at mains water pressure which can be upwards of ten times the pressure. Older pipework and connectors may not be able to cope with the much higher pressure and start to leak; if the installer is being asked to guarantee these being leak free then they would generally want to replace suspect pipework (some of it will be hidden under floors so it will be difficult to inspect). *Boiler sizing for combi’s is often driven by the instantaneous hot water flow needed rather than the heat demand so often the combi boiler is more powerful than the old boiler it is replacing. That is fine provided the gas supply and the mains water can cope with this increased demand; you may need to increase the gas pipe size to provide more gas to the boiler. Potentially the same is true with the water supply. Hope this guides your thinking. Replacing with a combi is fine provided these issues are considered beforehand. Hi Jon, I have a gravity boiler with a Baxi Bermuda gas fire. There is an electronic control panel with a timer and settings for either hot water, heating or both. However, the heating always comes on regardless of the settings. The two valves have slide switches on them – could these stop only the heating coming on? I would replace the while thing with a combi and electric fire front, but we’ve put the house up for sale. Thanks. I want to eventually have a unvented setup! However people always talk about unvented with systems boiler! But surely you can have an unvented system with a heat only and a separate expansion tank and pimp or a system boiler (so lose the f&e tank in the loft) with an open vented cylinder! I want to upgrade the boiler to a system boiler lose the pump in the airing cupboard (its noisy anyway) and lose the f&e tank as it has a problem with the float valve! I want to keep the big cold water tank and current cylinder so the hot water stays gravity fed! At a later date i then what to add an unvented cylinder and then lose the big cold water tank! I know it would be easier at once but it would be purely for cost reasons! I have a dilemma regarding a 4 year old condenser boiler. I live in a new street where all homes had the same system fitted. Everyone has had dreadful issues and British gas have refused my neighbour cover due to them saying our systems are too complex! My neighbours have been paying hundreds every visit to the original installation company and they seem to be charging for things that were faulty from original fitting which they did. My 69 year old neighbour has got to the point where she is going to pay 2.5k for a combination boiler to simplify it so she can get help when it breaks. She has had 3 controller boards in 4 years and no one can help with programming her system. I had mine serviced and the guy found 3 very expensive fitting faults and I told him to service the thing and go away and mines run fine since I’ve stopped servicing it. I bought a nest so I can finally control the thing. 3 of my neighbours are looking to now replace their entire systems but it seems so wasteful on a 4 yr old system. Surely the heating fitting company can’t get away with this kind of behavior and how can BG walk away from complex systems? We have a 16 year old Potterton Boiler that has been discontinued for some time. Recently we had a slight problem with a radiator and the plumber who came round mentioned that it would be very difficult to find parts when the boiler does start to have problems. We have a gravity system and would want to keep that as we like the airing cupboard! So, is it worth looking at a replacement now (for example using British Gas offer of £400 off), or just waiting to see if it breaks down? I am confused by the labour charges….. if the boiler cost of £800 to £1,000 is taken out of any quote for a 3 bed house or less, then the labour is costing £1,000 and MORE for work that can be done in a day for a like for like replacement! I don’t think footballers should get this ridiculous amount, but I especially don’t think gas engineers should either! This is more than surgeons who train for a decade get and everyone thinks it is perfectly acceptable. Am I misunderstanding something? Hi Paul, thanks for the query. Typically a replacement boiler takes between 1 and 2 days for a like for like boiler replacement at a rate of £300-425 per day + VAT but bear in mind this also includes much more than an hourly rate for one person i.e. the cost of overheads such as vehicles, phone contracts, tools, trips to pick up materials, time to do quotations, pipe fittings etc as well as the marketing and other costs for the installation business. Changes to wiring circuits may also require a qualified electrician to certify the work. Sometimes “like for like” replacements are simple and take a day, at other times changes to flues, fitting new condensate pipes or upgrading gas supply pipes are required – hence the broad £500-£1,000 guide we give for heating engineer labour. Where these overhead costs and additional work are recovered will vary according to the individual business – many do not itemise individual items but quote a total price for the completed job. As always it pays to get two or three quotes so you can get a competitive view of what work is required on your specific home. Hi, I have an electric emersion heater with the cold water storage tank in the loft (Bungalow) I am interested in changing it out for a Gas boiler, is this possible, if only for the hotwater, I have electric storage heaters which I do not want to replace yet. I have a gas fire in the living room, so I have a gas supply. My thoughts were I could change the water heating system for a gas combi boiler maybe large enough to add in radiator at a later date…. I have had a quote from a “British Gas” engineer to replace the boiler . Could I just have replaced the faulty control on the old boiler ? Hi Michael, thanks for your query. You have put “British Gas” in quotes for some reason. I am not sure why. British Gas do use independent engineers for their installation work, hence they tend to be more expensive, but if it is a British Gas quote they would certainly have given you a detailed estimate before the work was started. Replacing the flue may well have been necessary (regulations do change) but that should have been anticipated on the estimate. Likewise the upgrade of the gas supply pipe from the meter to the boiler could have been anticipated by checking the gas pressure drop. There is generally no requirement to gain planning permission for installing/replacing a boiler unless you are in a listed building. The work would have to meet building regulations. This would usually be achieved by self-certification by a registered gas installer. It’s hard for me to comment on the specifics on whether a repair would have been possible in this case but a registered gas installer should certainly refuse to repair a boiler with a potentially dangerous flue or insufficient gas pressure. I would suggest you contact British Gas and raise your concerns. Thank you very much for taking the trouble to write this article. I’m in the process of getting quotes for replacing a Halstead Gold combi boiler that was installed about 16 years ago. Your advice has been very helpful. We installed a Potterton combi boiler in our 2.5 bed semi detached house about 3 years ago (hasn’t been serviced yet). In the last week or so the bath water has gone from very hot and relatively good pressure, to a trickle of hot that intermittently turns cold. It’s driving me bonkers with frustration! We’ve gone up into the roof and re-set the system, but it hasn’t made any difference. It would be hard for me to diagnose this properly. I am by no means on expert on boiler faults. Clearly the hot water flow is being reduced in some way. This could either be a blockage or some valve somewhere in the system not working correctly and restricting the hot water flow. As the boiler appears to be cycling (hot then cold) I would suspect some form of water pipe blockage which is causing the boiler to heat the water hotter than it would like to and then some form of safety cut out operating to protect against too high a temperature. This can be as a result of something like an inlet filter being clogged with copper swarf (when the pipework was originally installed) or sometimes on new build properties bits of plaster get accidentally dropped onto the pipework. This is just guesswork so I am afraid a service engineer is probably your best bet here, particularly if the boiler has not been serviced since installation. Servicing does not need to be costly if there are no worn or damaged parts to replace and often the heating engineer who carried out your install offers this service. If it is something simple like a filter this is not a major task but as I said earlier this is just an educated guess. I have a 16 year old system boiler – A Boilermate III cylinder and a Potterton boiler. Is it possible to replace just the hot water cylinder or do we need to upgrade the entire system? Generally you should be able to replace the hot water cylinder in isolation. If the heating engineer feels that there are other things that need replacing he will advise you of these. 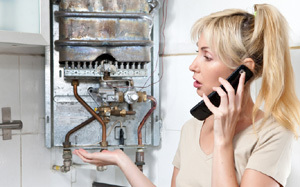 If well maintained there is no reason why your boiler can not go on for many more years. At some getting stage spare parts becomes an issue for older boiler models. If the boiler is actually unsafe (not just old) then he may recommend replacement. With changes to the Boiler Flue Requirements, is there a compliance certificate required on installation of the new boiler that would be required from a health and safety and insurance perspective? In England & Wales work on the installation or replacement of gas appliances is notifiable to local authority building control. This includes installing or replacing a flue. Normally this would be self-certified by a Gas Safe registered installer. The installer fills in a form which gets processed by Gas Safe. Gas Safe then send a building regulations compliance certificate: this would either go back to the installer who should forward it on to you or it can go directly to you. You will need this compliance certificate if you are looking to sell your house to demonstrate that the system has been installed by a competent installer. After digging out and fitting a Condensate Drain Pipe, is it usual to leave the replacement of slabs, cementing etc to the homeowner? For the amount of the labour, I was expecting to have nothing at all to do once he’d gone. Simon, please don’t beat yourself up about it. The main reason I set this site up was to try and address the balance between central heating installers and householders in a fair way. As you say the average householder probably buys a new central heating system every 10 or 15 years so is at a big disadvantage in terms of purchasing a new system compared to someone who installs them all day every day for a living. It’s hard to know what to pay, what questions to ask and what is reasonable to expect which is what this site tries to help with. Anyway enjoy your new boiler. Hope it keeps you warm and cosy throughout the winter. Boilers can be really expensive if you aren’t careful.. The wrong boiler type can see you losing money even further in long run! This is a really great guide on making sure you are not overspending on a new boiler. I know that new appliances can be expensive, but that doesn’t mean you need to rob yourself. And if you really want to save money, you should try focusing on repairing your boiler. What an excellent article, thank you. This has really helped me in my ‘boiler replacement’ mission!! Great article! And it’s great to see something that’s realistic in terms of the prices. Many other forums give the same generic answer of £2-£3k for a boiler swap! That’s expensive, we install all of the brands above with a magnetic filter and new controls all power flushed and guaranteed for 5 years from £1400! The Worcestershire and Vaillalnt are a touch more at £1650 including condense and gas upgrades! Great to see the prices that you’ve quoted. I’m just about to buy in the north east, can you recommend a reliable engineer in this area please? We don’t do boiler installations ourselves. Check out https://great-home.co.uk/choosing-an-installer/ for a guide on how to choose an installer. If you want a quick way to get quotes for boiler installation from local installers then click here.